Not a failure by any means, but this slightly sweet, complex spicy chip is still only a pretender to Cajun Spice Ruffles, here's why. 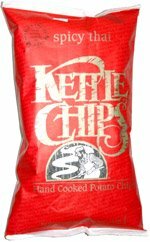 Kettle-cooked potato chips are most usually very crunchy, and sometimes even much more potatoey, but can be pretty oily, and kettle chips have a distinct greasy finish akin to a pork rind. This flavor is quite good, though, and reminiscent of CSR. Kettle Brand usually does their flavors well, and even their absolutely disgusting Cheddar Beer chips (Uncanny would love them) are incredibly accurate flavor wise. It's just that a beery finish just makes the cheese taste fermented. I urge Kettle Brand to come out with a Beer and Bratwurst flavor instead. Beer and Brat? Ugh! That couldn't be anything other than disgusting. Sorry PP. It's true. The Cheddar Beer chips are PHENOMENAL. Delicious!!!!! AG, it just goes to show that you are not a serious human being. You have no appreaciation of brats. I'm not a serious human? I better tell my physician because she thought otherwise.